Point 'n' Click adventures are going through somewhat of a commercial renaissance of late, having been pretty much ignored for years. HD remakes and directors cut's have graced the digital marketplaces, and actual retail boxed releases of some new P'n'Cs have snuck onto shelves, albeit with a whimper rather than a fanfare. Of course the retro indie community never truly abandoned Point and Clicks, and Chris Jones's AGS (adventure game studio) development environment has been at the heart of this active scene since it's creation over a decade ago, with countless games having been made on it – of wildly varying quality. 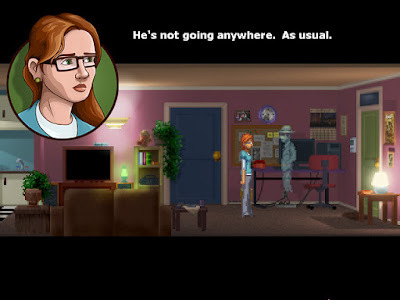 The Blackwell Deception is the forth game in a series of AGS driven games written by Dave Gilbert (no relation to Monkey Island designer Ron Gilbert), and continues on from The Blackwell Legacy, Blackwell Unbound and The Blackwell Convergence. Whilst each game is technically a stand alone affair, they are probably best enjoyed as a quadrilogy, containing references to previous games and a setting that, on its own, makes little sense and is given no real introduction. 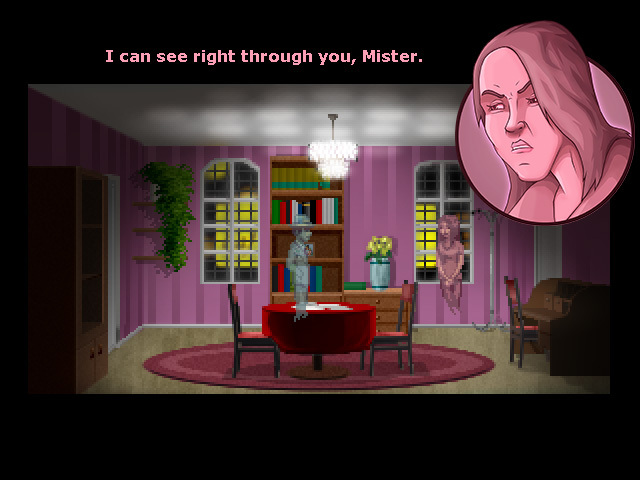 Blackwell Deception casts you as Rosangela Blackwell – a struggling journalist turned professional psychic investigator – and Joey - her 1920's era wisecracking ghostly companion. The game is contolled via a clean mouse driven interface – with right click being 'look at' and left click serving as a multi-purpose action button (pickup, use, etc). Puzzles are a mixture of dialogue trees, inventory use and some clever clue combinations that make use of Rosa's beloved 'MyPhone' accessory. Any clues that are (automatically) stored there can be used as conversation points when talking to characters, or – when accessed directly – can be combined to create further clues. The MyPhone also serves as a phone, an email client (which is not used massively within the game), and an internet search tool (which is used). Pressing TAB (or using the autohidden menu bar at the top of the screen) swaps control to Joey. He is less able to interact with the world than Rosa – only being able to blow small objects around – but being a ghost he is able to walk through doors. Handy! Together Rosangela and Joey help ghosts to 'move on' – in a setting that feels like the offspring the film Ghost crossed with a Raymond Chandler hard-boiled detective novel. Aesthetically this game shines – the film noir style music works excellently, the voice acting is (mainly) excellent, and the great low-res art is an example of how lovely games could look in the era of Sam & Max, Monkey Island, Full Throttle et al. (Although not quite as lovely as the previous game, The Blackwell Convergence). The absolute best part of this game though, is the script and the puzzles – which is exactly how it should be with an adventure game. The solutions are logical, there is a nice (admittedly linear) progression through the game, with sensible numbers of inventory items and locations available at any one time rather than overwhelming the player with options. The writing is funny (with Joey providing the bulk of the light relief) and occasionally quite affecting, as we explore some of the decently deceased's rather sad lives. This lightness of touch is more akin to the writing within the Broken Sword series of games, rather than the more overtly comedic Lucas Arts games previously mentioned. Throughout The Blackwell Deception the characters come across as rather more naturalistic and mature than Guybrush Threepwood or the Day of the Tentacle caricatures, and thus a genuine empathy can be evoked rather than it all being based around witty one-liners (although there are plenty of those too). It takes a great deal of skill in scripting (and voice acting) to pull this off, and successful examples are rare (in the mainstream or indie game development world). The Blackwell Deception is of moderate length – perhaps 6 hours – although this flew by, as I was enjoying the game so much. Unusually for a P'n'C game there is still some fun to be had once the game is over in the form of a Director's commentary – something Dave Gilbert has done since his game 'The Shivah' (an fascinating adventure based around a crime solving Rabii). With this commentary option turned on there are various spoken interjections explaining the game making process, as well as various commentary and blooper hot spots to click on throughout the game. It is amusing and fascinating insight - particularly if the thought of making and selling an AGS game has ever crossed your mind. 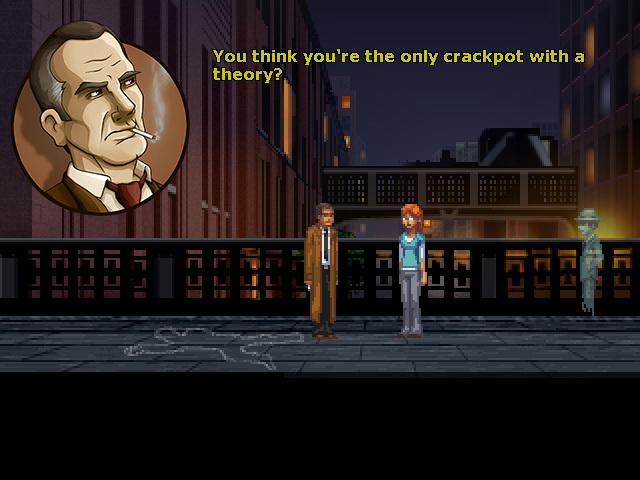 Overall a slick interface, an engaging setting with fair puzzles and great audio work make The Blackwell Deception the pretty much ideal point and click game – however it has to come with the caveat that this game is probably only at its best when played after the previous three games – which, whilst they are also excellent games, are not quite as perfect as this one is (particularly The Blackwell Legacy - the first in the series). 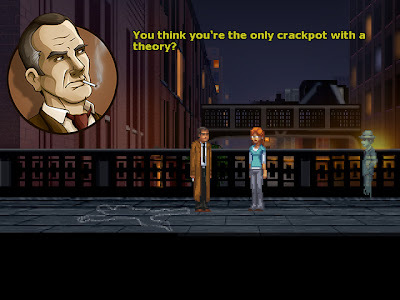 The Blackwell Deception comes unreservedly recommended for players of the previous games, although individuals sufficiently interested might be better placed to look at the previous games beforehand. Via Steam: The Blackwell Deception is £6.99 or £14.99 as part of the Blackwell Bundle of all four games (with the first three individually retailing at £3.99 each). Buy the game here. Via Wadjet Eye's own website: The Blackwell Deception (DRM free) costs around £8, and the first thee games are bundled together at around £12. Download the demo or buy the game here. Note: Whilst the demo that is available showcases the interface and aesthetic nicely, it does very little to introduce newcomers to the characters (presumably relying on the player's experiences with the previous games/demos).